One of the first titles in a new black-and-white cartoon series from Lion, following the success of the popular Thing About...series, Survival Tips at Work looks at the ups and downs of working life. Top cartoonist John Byrne combines practical tips with cartoons to produce a book that is both entertaining and helpful. As a gift or self-purchase, Survival Tips at Work will amuse and encourage any employee. 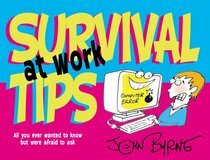 About "Survival Tips At Work"
Byrne was born in Walsall, England, in 1950. His family emigrated to Canada in 1958. He found himself at the Alberta College of Art, in Calgary, where he completed two and a half years of a four-year course in Fine Arts.